Comments on "On The Street.........Mad Plaider, Stockholm"
Great shot - the red is superbly set off by the green of the park. There's a new kind of feet fetishism, er, afoot. Until you look below his knees, what you see isn't particularly arresting--though the vintage pants (or so they seem) are a nice choice with the shirt. But below the knees, well it's all action. And very pleasing. You were right! So much good hair in Sweden! He's gorgeous! Ugh what is it with swedish men hmmm? They all look so beautiful! I ought to go to sweden. Enough already with the wacky Swedish outfits! you are SO getting even with all those negative "red sock" posters, aren't you? it's almost too funny/good to be real. . . you staged this, didn't you? He's absolutely gorgeous. I love the devil-may-care roll on his trouser cuffs, and I love how the socks tie it together with the shirt, but for me, anyway, the shoes don't work. Sneakers, yeah fine, but these ones are just a little bit too beat up to help carry the rest of his look. How do these men get their hair to do this stuff? So neat, yet so effortless looking! Well, okay. Thought the pseudo-hastily rolled pant turned capri/"Thom Brown on brown sugar" was more of a female thing, but it's interesting on this fellow. May just be due to the shot's set up. erh wow this is conflicting. i think there is simply too much going on with his look. the cool thing about this look though is that he demands you to look at him. goodlooking man! Ok, I’m going to have to say on this one that his look and hair does not go with the outfit. I mean no offense, really... I’m seeing someone very punk or a lumberjack with this. But then again, he might have the right attitude. Wrong. Just wrong. Because, the pants accentuating the width at the hips has me thinking he'd have no difficulties in childbirth. Plaids nice. Not exceptional, but nice. Unfortunately he looks like a lumberjack in his red plaid. And what is with the rolled up pants? He needs to grow up and find a real pair of shoes and ditch the gaudy Converse footwear. O.k. now you have officially been in Stockholm too long. This is just plain odd. I like the colors in this picture.The guy looks a bit phony.There is too much that catches the eye in not a so nice way. So so glad I found your site it's like my morning coffee, well at least compliments it. I agree with Alice the green is a truly beautiful backdrop choice! Butch, I also agree the slacks are definitly a excellant have for him or any man for that matter. Is this person male or female? I love the genderf*** of those hips with that body/clothing. Also, I'm amused by yet another pair of Chucks. The chucks are kind of killing this look for me, I think the rolled up pants would look refreshing with a pair of oxfords but as-is it looks a little too "ironic teenager". The shirt is beautiful though. I am definitely getting heavily into plaid this fall. The hair in London is so dull when compared to the hairstyles sported by Stockholm's gents. The shirt is magnificent! is it a law that everyone has to be gorgeous in sweden? adorable! he looks like Paul Bunyon! Wow. His clothes really suggest a sense of whimsy that is in no way evidenced on his face. It's like he's one person from the shoulders up and another from the shoulders down. 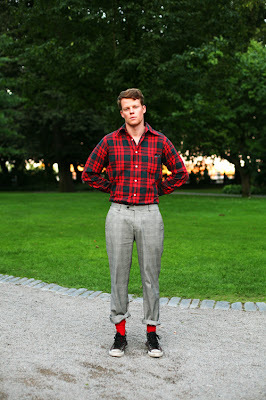 Great image of the red socks, but with an unruly hem? Does seem to show a new movement towards fashion socks this fall. I just read about the $300 sock in Fast Company. Said it's the new thing for men. But, why now? Eh...I'm over the rolled pants. Done naturally it's unexpected and casually cool, but it's gotten to the point where everyone is forcing it. This guy totally loses any sense of proportion. ...and here we have Darry, Ponyboy's brother. Very retro, post WW2 style with arresting red socks. Very good hair indeed and a strong face. He's got it. The Swedish Paul Bunyan! No, thank you. Gorgeous colors - reds, greens (the background), browns. Umm, where's his belt? Dunno where this idea of rolled pants originates from, but he could do that more carefully anyway. love it. very true, he does feel very vintage 1940s/1940s. i like how classic it is but with the socks and chucks and the way he carries himself it becomes modern at the same time. It's true you can't help not looking at him. It's something about his curvy hips that throws me off, very feminine like although he has a manly face. Lumberjack meets handsome boy. I like it. very 30s American college sportswear feel. which, yet again, is my kind of stuff. The child-bearing hips aspect, as one poster noted, really has more to do with pocket placement than with his anatomy. Guys, take heed: avoid side pockets if your hips are broad or if the pants are tight; the pockets will buckle, creating unflattering "buckles." Clothing may not make the man but sometimes the man makes the clothing. Had he not been so good looking this picture would be on some website as a fashion don't. I cannot believe a man would put this on then leave the house. Sure, he's "Allowed" to wear this, but why would he!? Absolutely tacky. Once again, the cult of personality rules on "The Sartorialist" instead of good taste, style...and dissenting opinion. I don't like contrasting socks with suits and dressy outfits, but I'm all for it when going casual. Shirt suits this guy so well and pants are really original choice, if only he didn't go too original with rolling his pants too much. Just a bit of red under pants would be perfect. Is it just me or are the Swedes the Japanese of Europe ? They put everything together well but someone their style just lacks a little soul . Just a thought. so wrong! but delicious men make up for bad fashion every time! this is a nicely composed shot, btw. i love the look of this man. Really love it. ooh I can´t take the socks. they punch me out.